Jean Sibelius: Symphonic Fantasy "Pohjola's Daughter"
As part of the European Galas series hosted by the Center for Fine Arts in Brussels and the Flanders Festival, the Philharmonia Orchestra of London under its current music director Esa-Pekka Salonen brought a remarkable evening, covering no less than two centuries of music. Starting with Jean Sibelius' rarely heard Pohjola's Daughter from 1906, they fast-forwarded us to 2009 with Salonen's own Violin Concerto, before bringing us back to 1813 with the Beethoven Seventh. And although these compositions might as well have originated on different planets, rhythmic drive is a prominent feature in all three. 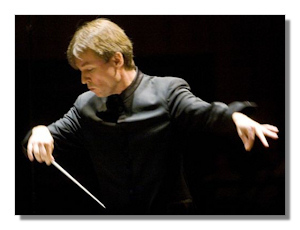 By juxtaposing Beethoven with contemporary music, Salonen replicates his "Beethoven Unbound" project from 2005/06 with the Los Angeles Philharmonic. Inspired concert programming like this is all too rarely found, and it's still most welcome. The symphonic fantasy Pohjola's Daughter, which sources like Sibelius' anterior Lemminkäinen the Finnish folk epic Kalevala, was given a ravishing performance. The atmospheric opening immediately demonstrated the superb Philharmonia strings, transparent yet utterly suggestive, while Salonen brought out the work's colorful orchestration with a sure hand. The hushed pizzicati contrasted with the Sibelius "wall of sound" to thrilling effect. Although scored for a gigantic orchestra, with the Philharmonia covering practically every inch of space on the Center for Fine Arts stage, everything seemed to fall perfectly into place. Salonen-the-composer joined Salonen-the-conductor for the next item. His Violin Concerto was commissioned by the Los Angeles Philharmonic at the end of his 17-year long tenure as music director (1992-2009), a term which evidently had played a key role in his development as a musician. The 30-minutes long four-movement concerto scored for large orchestra with an extensive percussion section, including a drum kit, was at the time for Salonen who had just turned 50 and wanted to spend more time on composing, no less than an artistic and personal status quo. Recently awarded the distinguished University of Louisville Grawemeyer Award, it remains a work of genuine inspiration and originality. Now played by the Philharmonia Orchestra and fueled by a sterling virtuoso performance from Leila Josefowicz, for whom it was written, the concerto strikes as a dizzyingly complex sonic exploration, fascinating from start to end in its search for unusual timbre. Josefowicz, fearlessly committed and playing from memory (and not at all hindered by her advanced pregnancy), unraveled the daunting solo part with panache and captured the changing moods of the piece with uncanny precision. Salonen kept the orchestra on its toes, whether in sparse accompaniment or in shattering outbursts. The final "Adieu" movement makes this a truly unforgettable composition. I was rather more skeptical about Salonen's rendition of Beethoven's Seventh. In fact, the time-travelling I alluded to in the beginning wasn't really happening. Salonen's Beethoven is reluctant to go back, but seems hesitant at the same time. I have never been convinced by this often seen hybrid orchestral setup for performing works from the Classical and early Romantic era, mixing modern instruments with old ones. It's like picking up a few ideas from authentic performance practice, but then stick with the usual modern concept after all. The Philharmonia switched to three valve-less trumpets (Beethoven only wanted two) and hard sticks for the timpani. They create a different sound picture, but on the other hand huge strings sections continue to outweigh the woodwinds. In the end this is still big-band Beethoven with an occasional period-performance edge, which unfortunately, when handled in an unsubtle manner, can stick out like a sore thumb. And subtlety wasn't really what Salonen was looking for. After an auspicious opening chord, which sounded as balanced as one could hope for, Salonen coolly led his ensemble through the introduction, omitting any sense of expectation. As soon as he launched into the Vivace, though, the tone that would dominate most of the symphony was set: this was string-driven Beethoven punctuated by trumpets and timpani, dynamic and incisive, but unsmiling and cold, hardly ever captivating and far too unbalanced. Woodwinds and even horns struggled to be heard in the mass of strings and the few occasions they had the spotlight for themselves, as in the Allegretto, only made us regret they weren't more prominent. The trumpets had no problem to affirm themselves during the tutti and quickly became obtrusive and weary. No blame to the orchestra, but does giving Beethoven a contemporary edge really have to squeeze the humanity out of him? Salonen gratified the audience with a meltingly beautiful rendition of the Valse triste from Sibelius, which he conducted without baton. He gave us a glimpse of a totally different world again, and yet there was nothing dusty about it either. But it had a beating heart. Too bad then, he denied Beethoven that.